Superheroines and heroes take to the stage. 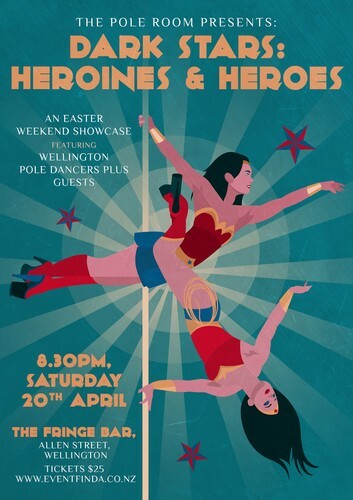 Come and watch a show filled with talented pole dancers from Wellington and special guests from around New Zealand! The Easter Weekend needs a bit of spice added to it - come and see "Dark Stars: Heroines & Heroes" on Easter Saturday! Performers are Giada & Maree, Eri, Libby Winehouse, Ileia Fox, Terumi & Rebekah, Melanie Lynskey, Misty,Christine Way, Leena T, Myley, Karina & Gabbi, Soumya, Lucy Greig and Riley Rayne. Our emcee for the night is the fabulous Katie Roberts. We created The Pole Room NZ seven years ago as a regular event to showcase Wellington pole, both up-and-coming performers and established polers. We also invite out-of-town guests to perform. The Pole Room has run almost thirty shows including the inaugural "Pole Inferno" Pole Competition in 2017. We have seen many of NZ's top pole dancers perform and support it. Wellington is a great place to run a show - it's so central and easy to get to. We hope that the Pole Room continues to inspire and encourage pole in New Zealand, and we would love to see you at our next show on Easter Weekend 20th April 2019.